Space Object Box: Little Bear, etc. motif, mid-1950searly 1960s. Box construction and collage, 11 x 17 1/2 x 5 1/4 inches. Joseph Cornell was born December 24, 1903, in Nyack, New York. From 1917 to 1921, he attended Phillips Academy, Andover, Massachusetts. He was an avid collector of memorabilia and, while working as a woolen-goods salesman in New York until 1931, developed his interests in ballet, literature, and opera. He lived with his mother and brother, Robert, at their home in the Flushing section of Queens. We paused in front of a glass-covered shadowbox with feathers, beads, bones and shells. 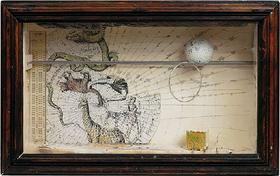 I commented on the artist�s obvious influence by Joseph Cornell. We walked into the next studio. �And," I continued, "not too many people recognize Richard Brautigan's name either, but you did." The sign outside the open doorway, painted in bold brushstrokes, read Erve (with an accent on the final �e�). �How to you pronounce that? Irv?" What can I say. I am consistently amazed by the synchronicity of it all. You'd be terrified of mine, very similar notion but uses credit cards (mag-stripe, not chip) as a substitute.